Don't mess with classics. I'm talking to you, Michael Bay. Spoiler alert: The Teenage Mutant Ninja Turtles are not supposed to be from outer space. They are from earth and came about from mutagen. But I digress. Alpinestars understands not to mess too much with things that are working. 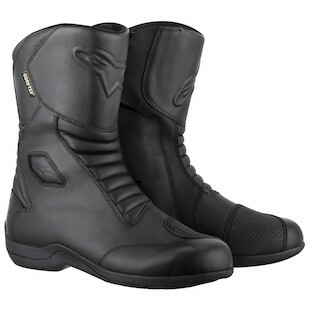 The Alpinestars Web GTX Boots are the epitome of a touring boot. Classic black boot styling in a tall protective stiff boot. The newest iteration only has slight changes that only improve on the boot. Small revisions over the previous Web Gore-Tex Boots include a lower profile toe box for better interface with a shifter, articulated bellows along the back of the boot for better flexibility, and a zipper redesign for easier entry and exit into the boot. The high quality Gore-Tex membrane and touring styling remain unchanged in the new Web GTX Boots. The CE-certified boots are as protective as ever, with a reinforced shin, double-density ankle-disk protection, and a reinforced stiff insole. Whether you're riding a sport-tourer, tourer, or cruiser, the Web GTX boots will complement your ride. Black goes with everything, and the amount of protection will go well with pretty much any street bike. Michael Bay may be trying to ruin the pop culture from your childhood, but Alpinestars will do no such thing. They know not to ruin a good thing. The latest release of the Alpinestars Web GTX boots are still the same boot commuters and tourers love, but with new improvements.